SAN DIEGO, Calif. -- Every Friday night the Southbound I-5 from Los Angeles to San Diego is packed, and the explanation is simple: People love San Diego. And why not? The authentic Mexican food is actually authentically Mexican, the ocean is visible from pretty much everywhere, the smog is not suffocating, and the temperature varies a total of about 3 degrees annually. In fact, to be a weatherman in San Diego, absolutely no degree is required. The only requirements are a nice haircut and a mouth that talks. It's a good place to play some golf. Designed by John Cook, Salt Creek Golf Club is nestled in Mt. Miguel and is surrounded by protected wildlife refuge. But not everyone can afford to play the meccas. Torrey Pines, although a sheer gem in the truest meaning of the word, ain't cheap. Not everyone can shell out that kind of cash to hack it around out there, nor does everyone want to. Some of us simply want to have a few suds, shank a few balls, gamble a few bucks, crash a few carts, hit on a few beer girls and drop a few quarters in the Golden Tee machine on something just a little bit better than a dog track. Well, here you go. Take the pen out of your shirt pocket and jot a few of these down. Located at 525 Hunt Parkway in Chula Vista, the Salt Creek Golf Club can be played by non-residents for $75-$85 Monday through Friday and for $95 on weekends. Designed by John Cook, Salt Creek is nestled in Mt. Miguel and is surrounded by protected wildlife refuge, so leave the arsenal at home, Mr. Nugent. With five sets of tees that range from 4,800 to 6,800 yards, three lakes and 78 bunkers, all should be at least a bit challenged by this layout. If not, drink more. This one is less for the hackers, as most Dye courses are. Carlton Oaks Country Club, which was designed by Perry Dye, is located a bit east and a bit north from San Diego at 9200 Inwood Drive in Santee, Calif. The prices of $55-$60 Monday through Friday includes a cart, as does the $80 tag for weekends and holidays. The Dyes have a knack for placing water right where everyone likes to hit it (No. 17 at Sawgrass), so be sure to come here to actually hit some shots. If not, either you're going to lose a lot of balls or you're going to be doing a lot of swimming. From the black tees, which now measure more than 7,000 yards, Carlton Oaks is truly a force. It hosted the 1974 NCAA, in which Curtis Strange eagled the final hole to propel his Wake Forest to the title. But don't worry, if you eagle the final hole, that doesn't mean you have to become a broadcaster too. At Castle Creek Country Club, the track is a little more benign and way more alliterative. Everything is a little less than at Carlton Oaks, whether it be the rates ($29-$45 Monday through Friday, $40-$56 on weekends and holidays) or the yardages (6,300 from the tips). 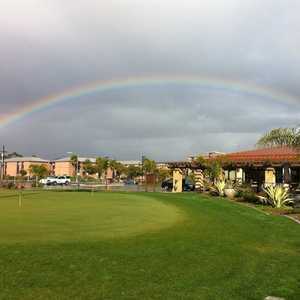 For a little stay-and-play, check out the DoubleTree Golf Resort at 14455 Penasquitos Drive in San Diego. The damage is just $50 Monday through Thursday, $60 on Friday and $70 on weekends if you go May through November. For your "winter" (Does it even qualify as winter if you're in San Diego?) escape, it is $55 Monday through Thursday, $60 on Friday and $75 on weekends. It is actually a golf resort, so you don't have to drive anywhere after. You can stumble back to your hotel room and continue to drown your 54 on the back nine in pina coladas. Junior and senior rates are also available. 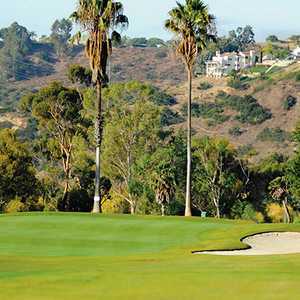 Rated second best golf course in San Diego by Sign On San Diego in 2002 and the best of Southern California Golf landscaping by San Diego County Golf magazine, also in 2002, Mt. Woodson Golf Club is a short, target-style jaunt. At just 6,100 from the tips, this par-70 does not beg Kuehne-esque tee shots. It also has three par fives, despite being a par 70, which satisfies those with a little taste for variety. But don't lick your lips just yet, Pavin, the home hole is a 497-yard par 4 from the back tees. It can be played by non-residents for $65 Monday through Thursday, $85 on Friday and $90 on weekends and holidays. Mt. Woodson is located at 16422 North Woodson Drive in Ramona. Also check out Rancho Bernardo Inn at 17550 Bernardo Oaks Drive. To satisfy our list, you must play this William F. Bell design Monday through Friday ($85 for non-San Diego County residents), as the weekend and holiday rate is out of your price range. Four sets of tees, with the longest set at 6,600 and the shortest at 4,900, provide for a large variety of levels of play. If you plan on playing the tips, water also comes into play on 10 of the 18 holes here, so don't whine to me when all your Pro-V1xs are nestled six-feet under the cool blue beyond. I warned you. At more than 7,000 from the tips, Barona Creek Golf Club demands a simple flat rate of $85 everyday, which includes cart and range balls. But for the short ones out there, don't fret. There are four other sets of tees, ranging all the way down to 5,200 yards. Barona is located at 1000 Wildcat Canyon in Lakeside. Playing host to a U.S. Open qualifier and a San Diego Open qualifier, Carmel Mountain Ranch Country Club at 14050 Carmel Ridge Road barely eases under $100. For non-residents, it is $78-88 on Monday through Friday and $98 on weekends and holidays, all including carts. This 5,000 to 6,400-yard track meanders through an upscale neighborhood and no two holes adjoin, making your chances of hitting another golfer less, but you can still aim at that guy in the gardener's hat and knee socks plucking his weeds. 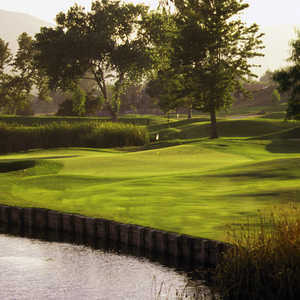 Steele Canyon Golf and Country Club: This Gary Player design is indeed a must. At $79 Monday through Thursday and $99 Friday, weekends and holidays, it barely makes the list, but it is well worth it. Located at 3199 Stonefield Drive in Jamul, Calif., Steele Canyon comes highly recommended by San Diegans. As host of the Junior World Championships 13-14 division every July, it boasts three nines: the Canyon, Ranch and Meadow courses. The lil' guys play Ranch/Meadow. I suggest you do the same. But don't get upset when they beat you. These are little Mickelsons and Tigers we're talking about. So there you go, a few for the hackers and the players alike. But just because I saved you a few bones, Mr. Pink, don't forget to tip your waitress.